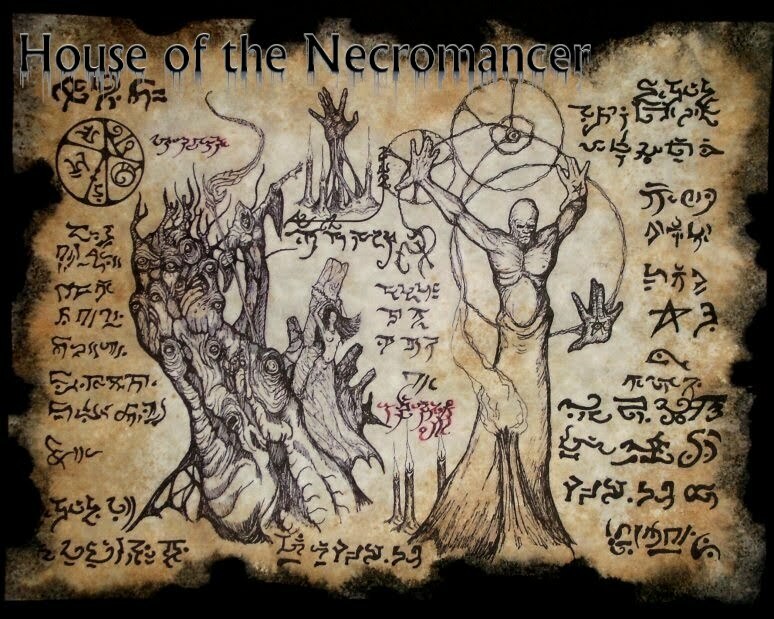 The sorcerer Ludvig Prynn had traveled to the temple of Yezyud , in the library of that foul temple was a book written by a madman named Abdul Alhazrad, a book called the Necronomicon by some mystics and Prynn intended to learn the secrets of that dreaded tome. The journey had been difficult, for not only is the land of Yezyud barren and inhospitable, it is veiled by magic and many who wander into that place never return. But the sorcerer had prepared well and made his way to the temple with little trouble beyond maintaining control of the four apprentices who had accompanied him, they sensed the strangeness of this place and desired with all their hearts to flee. Only fear of Prynn had stopped them from bolting, that and the certainty that they could never find their way back to the caravan route as the stars that shone above them were abnormal and the night in this land seemed so much longer than the days. The priests of Yezyud guarded Alhazrad's book and it would be difficult to gain their trust, only a scholar who humbled himself before their terrible god and gave proper sacrifice would be allowed to pass the great iron door and enter the library. 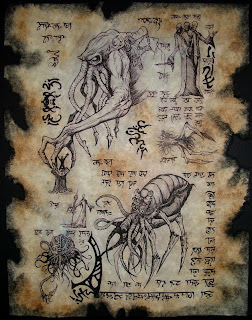 Prynn had studied the lore of Yezyud and he knew what was expected of him; he allowed the priests to cast his four apprentices into the sacrificial pit and sang praises to the huge, many legged thing called Yezyud as its tentacles drained the screaming victims of their bodily fluids. In a final abomination the wizard went into the pit and offered the monster a taste of his own blood to seal the pact. The reward was great, Prynn was granted one full day to study the Necronomicon. In that time he intended to absorb all the eldritch knowledge his brain could bear. The iron door swung open and closed swiftly behind Prynn, his shaking hands unlocked the ancient book and he began to read. An hour later his screams began, followed by sobs and pleas to open the door. But the servants of Yezyud paid no mind and the door was not opened until the first rays of dawn. Prynn strode forth with a strange light in his eyes that never left him for all of his days. The Necronomicon had opened his mind to realities he had glimpsed only in Black Lotus induced nightmares, beings from beyond had spoken to Prynn through those ancient runes and he was no longer a mortal man. Without speaking a word Prynn left that same day, his weary camel suddenly skittish of the man it had carried across the barrens to this unholy place. The priests of Yezyud went on with their normal affairs; stalking the hills for sacrifices to feed their gluttonous god. But curiously, Yezyud retreated to the honeycomb of caves beneath his temple and did not emerge to feed until a fortnight later, when Prynn had passed far from the hidden land of the Yezyudites.